During my entire stay in China I worked on a series of photos of people gambling in the streets. 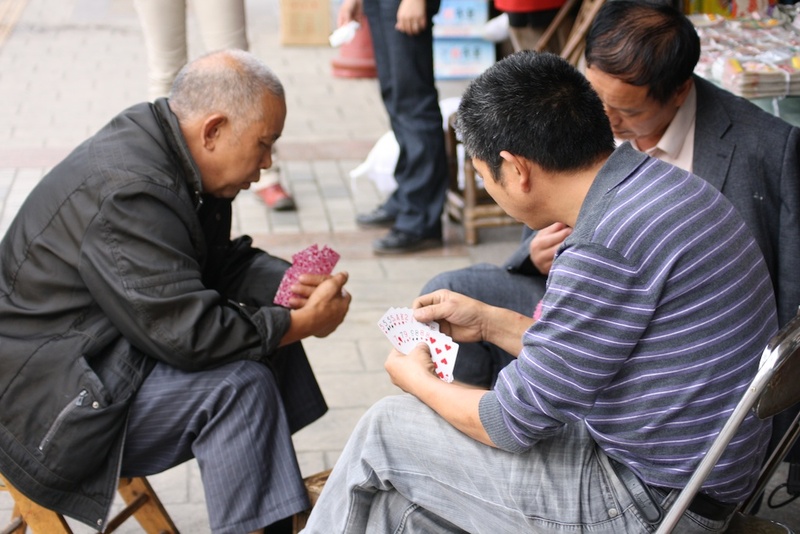 There are photos from Chengdu, Chongqing, Shanghai as well as Beijing of people playing a wide variety of games, from Mah Jong, over Chinese Checkers and a number of different card games, often for money. I was not only fascinated by the ubiquity of gambling but also by the importance of the audience, those who do not actively participate but merely watch the game unfold. Initially i asked myself whether it would be possible to identify narratives or media franchises that originated in China and would feed back into the global film or game universe. I began to undertake online research on baidou (the Chinese equivalent of Google) with the help of chinese translators and began to search through the DVD shops that are at present the most important sources for films and videogames in China. The ubiquitous presence of films belonging to the genre of wuxia, martial arts in the broadest sense began to catch my interest. Some recent Chinese Blockbusters such as the film Hero (2005) belong to this narrative genre can be traced far back into Chinese literary tradition. For example, the “youxia” stories from around 200 BC which dealt with incidents of attempted as well as successful assassinations of rulers during the “Warring States period” can be regarded as early predecessors of the wuxia genre. The word wuxia is a compound of wu, meaning martial or military and xia which means honorable or chivalrous. Many of these stories tell the tale of a single martial artist (often a swordsman) or pugilist who follows a chivalrous code of honor. Many of these stories resemble the European tradition of the medieval knight or the gunmen of America’s Wild West. Based on an older literary tradition, wuxia novels rose to a renewed prominence in the 20st century between 1960 and 1980 in books as well as films, here mainly in the films of the Hong Kong based Shaw brothers company. My interest as an artist, however, was not necessarily to gain a deep understanding of the genre or even the immense amount of films and novels that loosely follow the patterns circumscribed by this genre, but rather, as I had done in previous works to attempt to use the information about them as a kind of code and material for my works. Here especially i was fascinated by the links and cross references that emerged between the universe of wuxia films and other pop cultural phenomena, such as for example the famous Wu-Tang Clan Hip Hop collective that had used many of the samples of wuxia films in their music and lifted their own names as well as many of the titles of films and novels from the narrative of Hong Kong Wuxia films. Thus I began to collect information about the films, such as a comprehensive list of the titles of films produced by the most important production company, the “Shaw Brothers”, but additionally a list of the names of all the rappers, dh’s and musicians that belong to the Wu Tang Clan. Other lists that were of interest to me were, for example, a detailed list of different martial arts fighting styles, or a list of famous secret societies from wuxia novels and lists of the famous shoaling monk martial arts fighting styles. 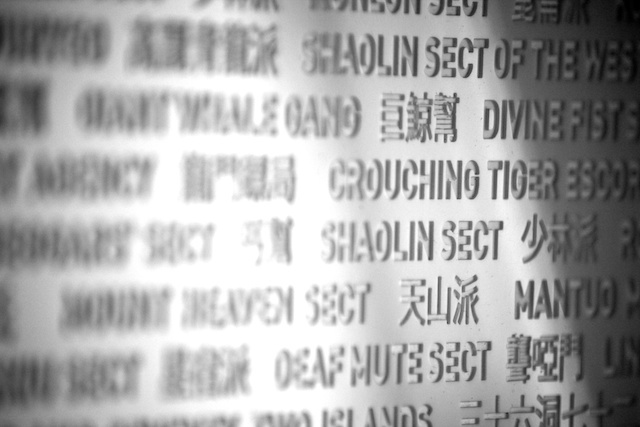 I was fascinated by these lists of words because they all belonged in one form or another to the global network of information which would appear with the traditions of wuxia. This (and other) text material, that holds many clues for the initiated (the fans of this culture) became the starting point for a series of text pieces that I began to produce with the help of local sign companies. I started to produce a series of prototypes with different companies in Chengdu. I wanted to produce three-dimensional forms of signs that would be information collections but at the same time aesthetically reminders of memorials. After producing a number of different prototypes I arrived at a satisfying formal solution and produced a series of text pieces which were engraved with cnc systems on the back of slabs of 15 mm acrylic glass and subsequently hand painted. I also experimented with cheaper versions of prints on plastic foil material, as it was used for local posters and advertisements. While, producing this series of text pieces, I began to search for other manifestations of the wuxia code in Chinese popular culture, such as online computer games and during conversations with many different people I was pointed in the direction of the so called Cosplay culture. I was told that the South Jiatong University would be harboring a group of cosplayers who were among others, making costumes and impersonating characters derived from Wuxia influenced online games. I was immediately fascinated, since it is precisely this transference of codes that i wanted to understand better and i decided to meet some of the people organizing costly events in order to learn more about this form. 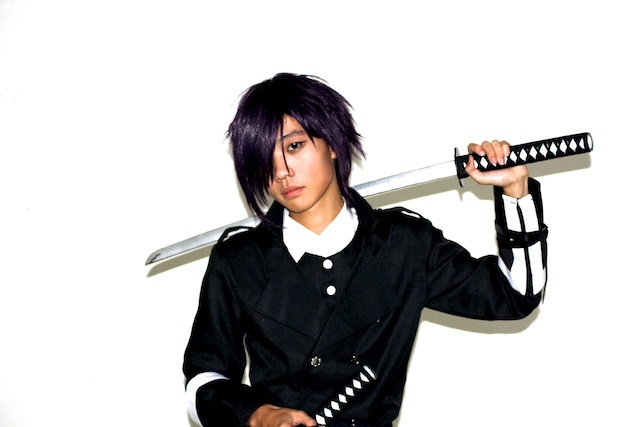 Up until this time, I was only aware of cosplay as a specific form of fan-culture originating in japan. Now I was confronted with a lively scene of “cosers” in the middle of Sichuan, China. Thus I began to make interviews collect information about their events, take photos with the cosplayers and film their event. During these events, I realized that I had found a fascinating form of global pop-culture that was deeply rooted in a participatory reaction to media franchises such as Comic and Animation films as well as as Computer Games. Thus I decided that I would limit my research to this phenomenon, not only because it perfectly illustrated trans-national cultural convergence and the growing importance of fan-culture, but also because I became convinced that a closer investigation of this culture would allow to pose some important questions about contemporary media culture as well as art. I was told that the South Jiatong University would be harboring a group of cosplayers who were among others, making costumes and impersonating characters derived from Wuxia influenced online games. I was immediately fascinated, since it is precisely this transference of codes that i wanted to understand better and i decided to meet some of the people organizing costly events in order to learn more about this form. Up until this time, I was only aware of cosplay as a specific form of fan-culture originating in japan. Now I was confronted with a lively scene of “cosers” in the middle of Sichuan, China. Thus I began to make interviews collect information about their events, take photos with the cosplayers and film their event. During these events, I realized that I had found a fascinating form of global pop-culture that was deeply rooted in a participatory reaction to media franchises such as Comic and Animation films as well as as Computer Games. Thus I decided that I would limit my research to this phenomenon, not only because it perfectly illustrated trans-national cultural convergence and the growing importance of fan-culture, but also because I became convinced that a closer investigation of this culture would allow to pose some important questions about contemporary media culture as well as art. What drew me to cosplay at first, was the fact that fans of specific media franchises, such as anime films and computer games, would attempt to bring the characters from these narrative universes to life by literally incorporating them. It seemed to me that this act represents a uniquely intense form of cultural participation and indeed production, since many cosers spend significant time and creative energy with the construction of their costumes.